Émile is 47 years old and is referred in orthodontics by an oral surgeon. He is suffering from severe apnea. He has been searching for a solution for the past 10 years. He underwent uvuloplasty which consists of the removal of the uvula and part of the soft palate. Apart from being painful, it did not solve the problem. He then wore a mandibular advancement device (MAD) which gave quite a good result for a certain period of time. The patient observed a lack of efficiency and he did not want to wear this kind of device every night while sleeping anymore. He used CPAP which propels positive air pressure in airways. This appliance is very efficient and allowed him to get restorative sleep. However, one needs to get used to a little compressor which makes a certain noise. One needs to adapt to a nasal mask, which is not always simple and the machine must be dragged around during vacations or trips, which is not always obvious. Moreover, Émile had more and more difficulties adapting to the dryness caused by a constant air blow in his nose. In short, he wanted a solution that would solve his apnea and he no longer wanted appliances. This patient presents a Class II division 2 malocclusion. The lower teeth are shifted backward compared to the upper teeth (red arrow). The lower teeth are completely covered vertically by upper teeth (supraocclusion). The upper left canine is longer than the right canine (blue line) and will have to be levelled individually to avoid causing inclination of the anterior occlusal plane. 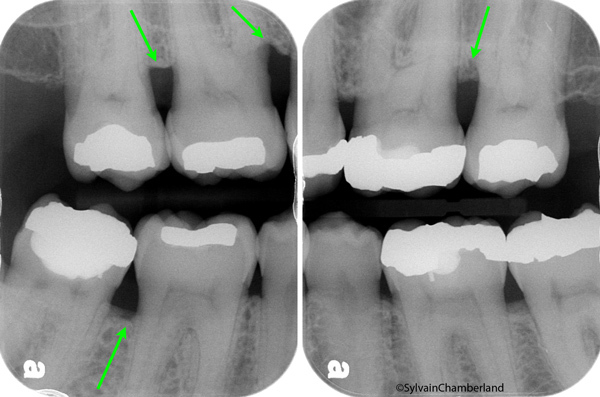 The green arrows indicate a bone loss problem (periodontics). Class II division 2. 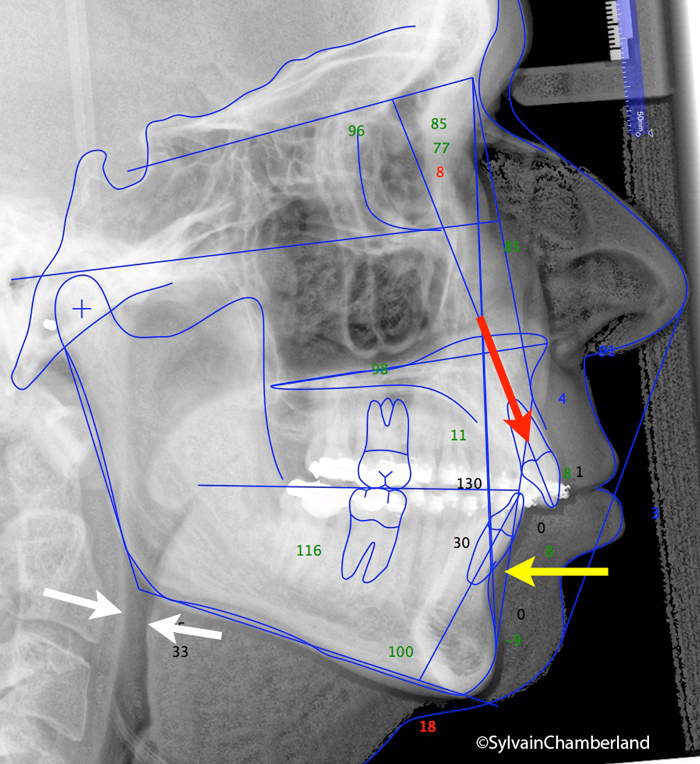 Airway restriction at the oropharynx level (white arrows). Backward shift of the lower jaw (yellow arrow). Upper incisor too vertical (red arrow). The cephalometric X-ray on the right shows the airway restriction at the oropharynx level. The narrowest part is only 4 mm wide (white arrows). To imagine the impact that this narrowing on air flow toward the lungs represents, imagine an ½ inch (13 mm) hose. Clamp it up until it is only 4 mm in diameter. You will observe that less water is passing through or for as much water to pass through, the pressure in the hose must increase. This is exactly what happens in an individual suffering from apnea. Insufflation pressure must increase to overcome the increased resistance to air flow. The heart works harder. The blood is less oxygenated. The lower jaw is shifted backward which means mandibular retrognathia or retrusion (yellow arrows). The upper incisors are in a very vertical position (red arrow). Periodontitis in adult. The green arrows indicate the areas of bone loss. The periodontitis problem is highlighted on these retrocoronary X-rays. The green arrows indicate the areas of bone loss. These are the same areas as on the intraoral picture above. Specialized periodontal care was necessary to facilitate oral hygiene during the orthodontic treatment and avoid the progression of bone loss. 2- Presurgical orthodontic preparation: dental decompensation and preparation using presurgical archwire. 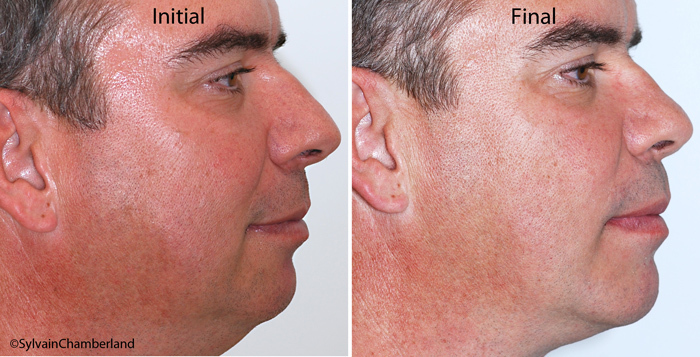 The series of pictures on the left shows the alignment obtained prior to orthognathic surgery. The red arrows indicate the shift between the lower jaw and the upper jaw. 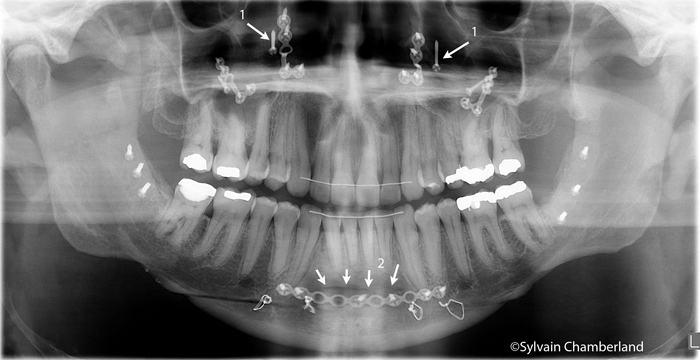 The cephalometric X-ray shows the decompensation of the upper incisors. Notice the forward tilting of the red arrow compared to the initial X-ray. The change in inclination is 14°. 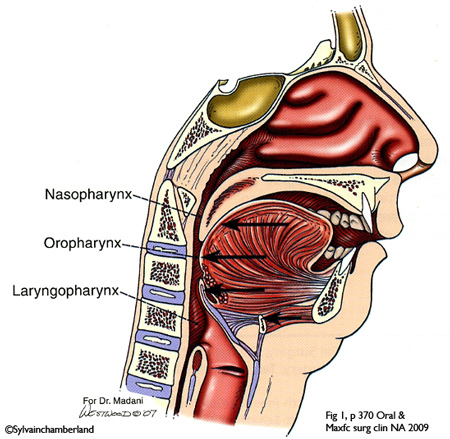 The oropharynx passage is still narrow. The duration of treatment from the day the fixed appliances were installed up until these appliances were removed is 93 weeks, that is less than 2 years. Here is the occlusion obtained after the maxillomandibular advancement surgery. Canines and molars have a Class I relationship (aligned red arrows). The lower teeth are now visible. The upper anterior teeth do not cover the lower anterior teeth by more than 2 mm. The left canine is at the same height as the right canine compared to the difference observed on the initial pictures (blue line). 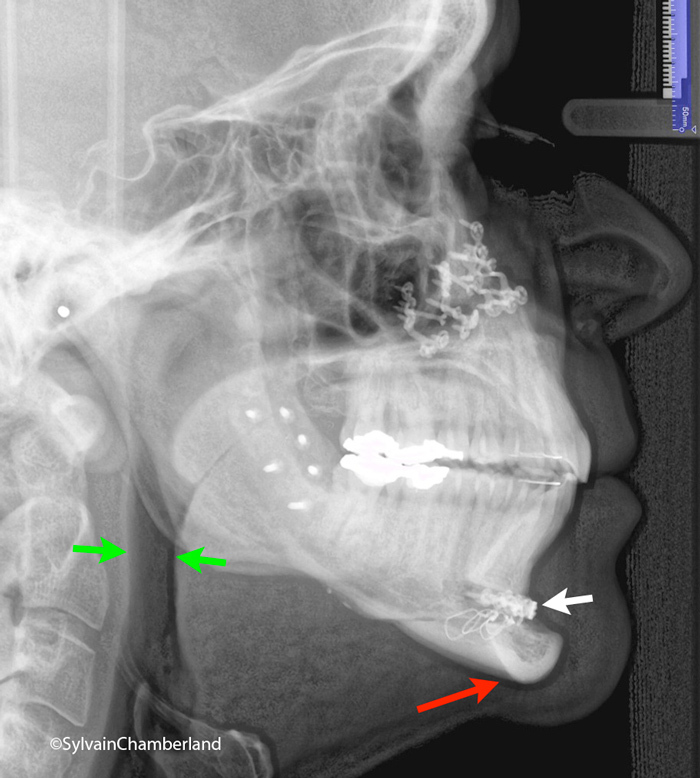 The green arrows indicate the embrasure opening of the interproximal papilla following the periodontal surgery to reduce periodontal pocket depth. The retraction of the interproximal gingiva reduces pocket depth close to a normal 3 mm and makes it easier to clean than a deeper periodontal pocket of 5 to 7 mm. Removal of appliances. Post surgery panogram. Number 1: fixation screws of iliac crest bone grafts on the malar bones. Number 2: cut opening for the advancement of genial tubercles. The plate allows the fixation of the genial tubercles in advanced position. The panoramic X-ray allows an overview of the skeletal fixations used during the orthognathic surgery. Bone grafts (number 1) were placed where the malar bones (cheekbones) are located. These grafts were harvested from the iliac crest (the top of the hip). The arrows in position 2 indicate the cut opening necessary for the advancement of genial tubercles to which the genioglossus muscle is attached. The goal of this technique is to move the tongue forward and prevent it from compressing the oropharynx. Orthosurgery post treatment cephalogram. Red arrow: indicates the anterior movement of the symphysis using genioplasty. White arrow: indicates the plate that holds the genial tubercles in advanced position. Green arrows: indicate widening of the oropharynx which now measures 10.5 mm. On the cephalometric X-ray, we observe the anterior movement of the symphysis using genioplasty (red arrow). The white arrow indicates the site of fixation of the genial tubercles. The oropharynx is significantly wider and now measures 10.5 mm. Effects on the patient’s respiratory capacity were immediate. He no longer snores, he no longer suffers from apnea and he no longer needs CPAP. For that matter, he resold it easily through a small ad. Superimposition of initial (black), preoperative (blue) and final (red) outlines. 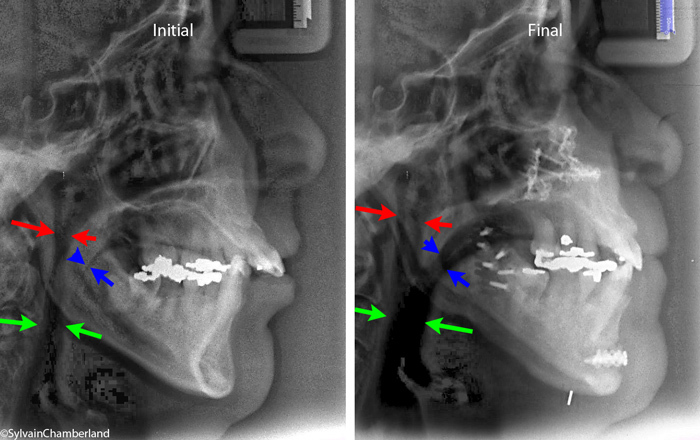 Superimposition of initial, preoperative and final outlines shows significant advancement of jaws and dentition. The maxilla was moved forward by 9 mm and superiorly repositioned (impaction) by 2 mm. The mandible was moved forward by 13 mm and the symphysis by 8 mm. The procedure was performed without complications. Some people could fear that changes of such magnitude change someone to the point where he/she would be difficult to recognize. It is not the case. Appreciate by yourself. However, notice the depth of the throat. This lengthening of the neck-chin length is also seen on the final cephalometric X-ray compared to the preoperative and initial X-rays. The following case introduces a 45-year-old woman referred by her pulmonologist, because she was suffering from severe apnea. The initial cephalometric X-ray (rx on the left) shows oesophagus restriction at the pharynx level (green arrows). 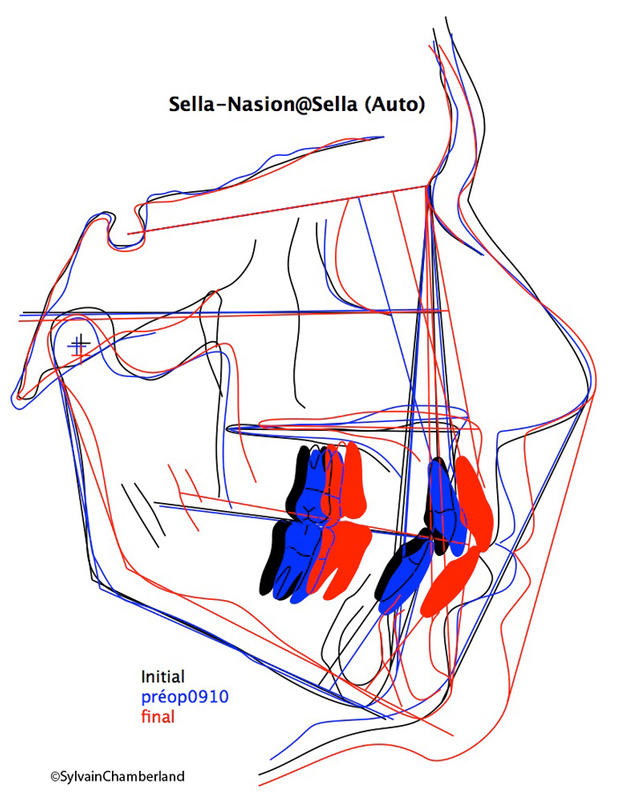 What is remarkable on top of this is that the airway obstruction is also located between the soft palate and the posterior wall of the nasopharynx (red arrows) and between the soft palate and the tongue (blue arrows). The final cephalometric X-ray (rx on the right) shows widening and significant clearance of airways as you can see it by looking at the distance that separates the arrowheads compared to the initial X-ray. This patient underwent a first surgical phase called SARPE (surgically assisted rapid palatal expansion). 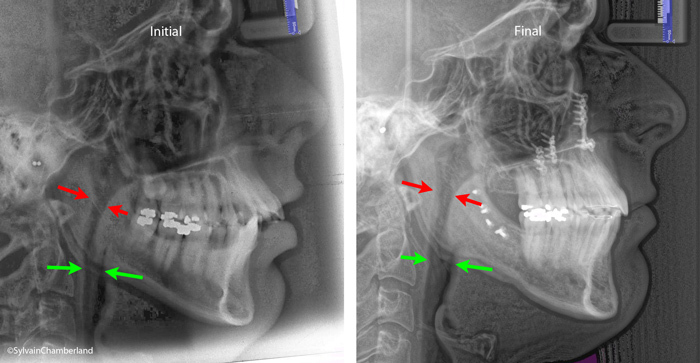 After orthodontic preparation and dental decompensation were completed, a second surgical phase consisting of a Le Fort I advancement and impaction osteotomy, a bilateral sagittal split mandibular advancement osteotomy and modification of genial tubercles was performed. It is possible to see the impact of simultaneous advancement of the maxilla and mandible by comparing the profiles. Notice the change in the angle and inclination of the neck-chin projection (blue line). 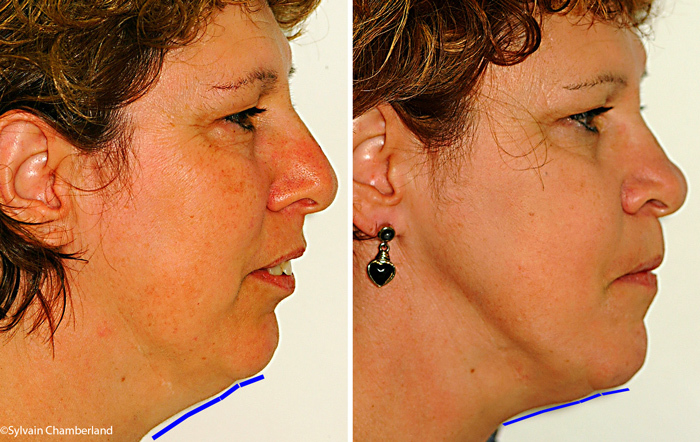 Change in the neck-chin projection (blue line) can be explained by the simultaneous advancement of both jaws. This 35-year-old patient presented mandibular retrognathia and prominent upper teeth. He was a chronic snorer to the point where he had to sleep in a separate room from his wife to allow her to sleep. After having received confirmation of an apnea problem, the surgical treatment plan was modified to include a simultaneous advancement of both jaws. Class II with mandibular retrognathia. Notice the change in the neck-chin projection after the orthosurgery treatment (green arrow). The lips which were always open initially are now closed in the rest position. 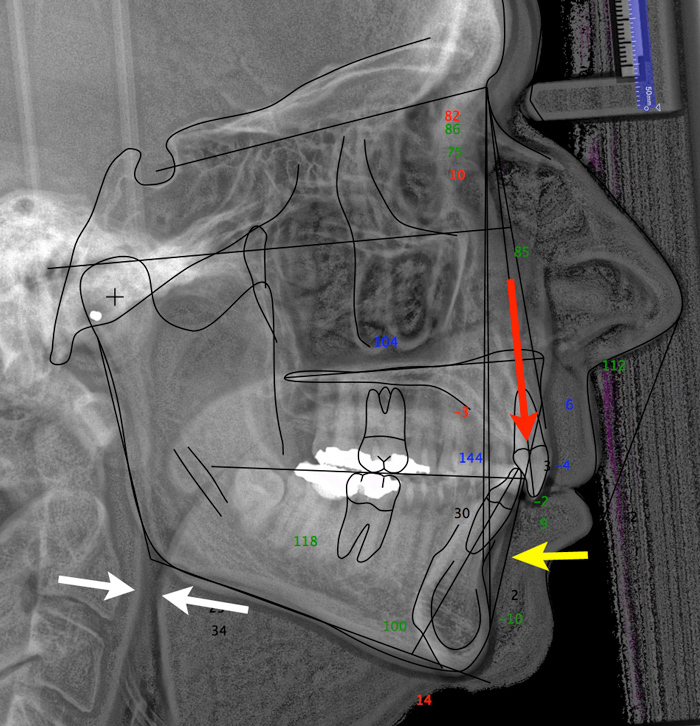 Simultaneous maxillary and mandibular advancement enabled the clearance of airways at the nasopharynx (red arrows) and pharynx (green arrows) level. This patient mentions that he no longer snores, he was able to start sleeping in the same room as his wife again and his physical condition has definitely improved. He says having a lot of energy, he feels less out of breath when he runs and works out.